Goodness gracious me, has it really been over a year since I posted? Whoopsy. Well if i'm honest I took another 'holiday' from knitting. 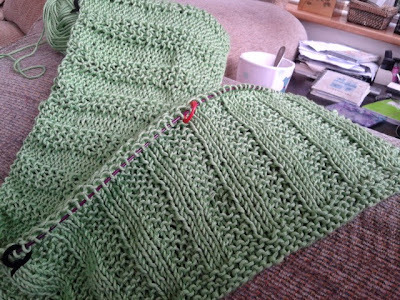 Not sure why, my knit-jo just...like, disappeared. I think its because I attempted to make a garment for my sweet niece just before Xmas but when I took part in a KAL with Love Knitting, but I had trouble understanding the pattern somewhere along the line, and the pattern designer took forever to get back to me on it that Bea never received her Christmas Jumper, so that project is hibernating somewhere....and well I just felt all blah with all things knitting then. I may actually get back to completing it and it will probably go to some one else with a baby sometime in the future. 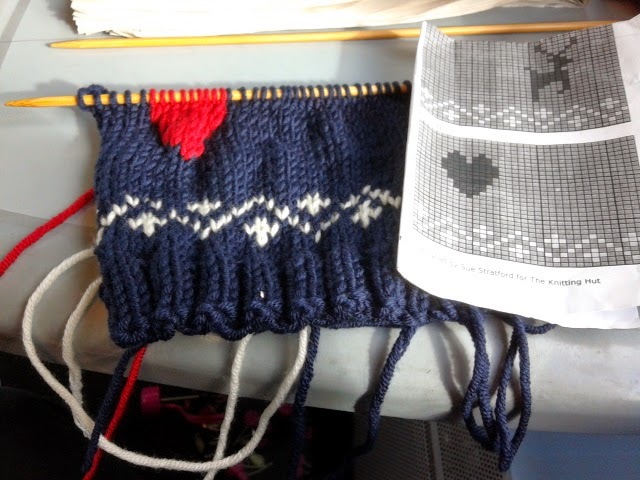 The plus side though is I managed to do another pattern which involved colour work and chart reading and it was fun to do. In the meantime, I will share something I'd made last summer but forgotten to update you all. Actually, it hadn't been blocked or seamed until now. 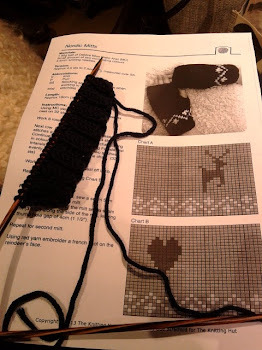 I'd seen this free pattern on the Deramores on-line yarn store. The pattern is by Rowan called Lacey Linen Snood. I thought this was really pretty and thought it would be lovely to wear in the warmer seasons. 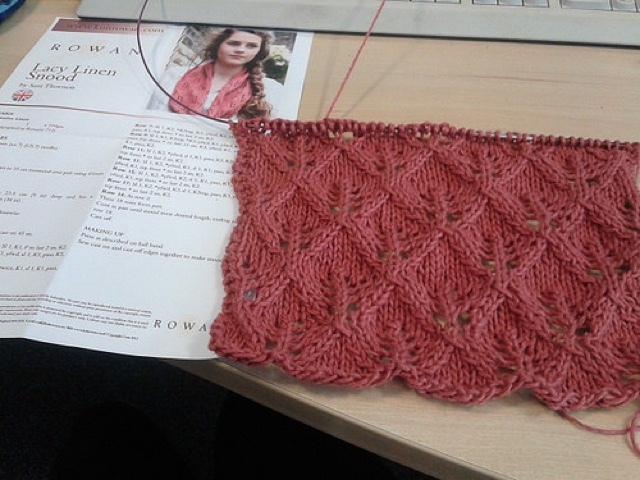 I used up almost the whole hank of Rowan's Creative Linen - yes I used a hank and let me tell you winding that up to a ball, gosh that took ages. 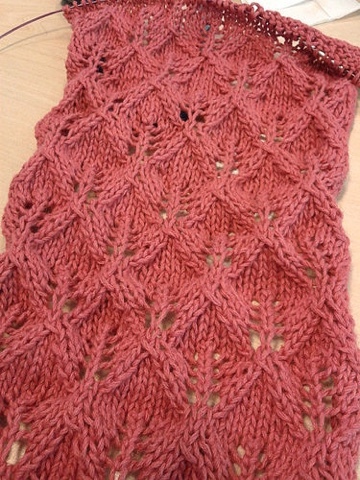 But I loved knitting this up and I got to say I love lace but one thing I learnt for sure is a life line is a must with lace projects. 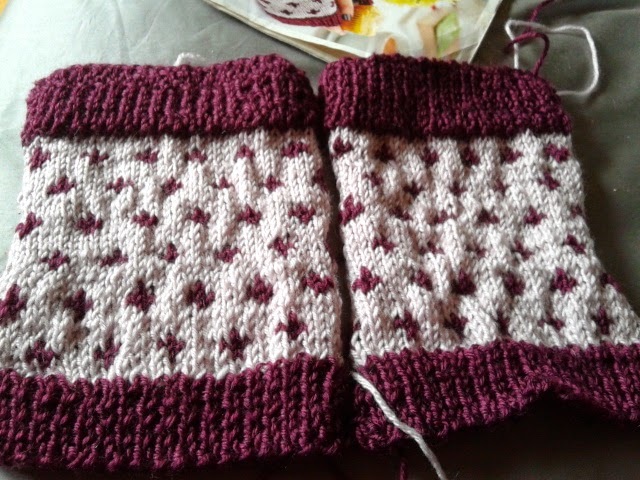 The edges are still curling a bit but after getting a bit of advice from a colleague of mine, I may fix that by adding a border around it since I do have a small bit of the yarn left. I always seem to be posting about what I've made on this blog. 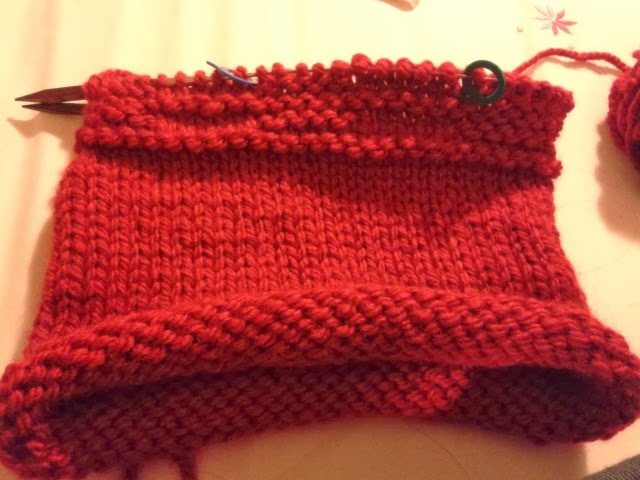 But a couple of weeks ago I thought I'd throw a little bit of fun by having a game of "guess the WIP" by posting a picture of what was on my needles at the time. I got pretty sick of carrying small projects with this largish tote bag that my friend gave me so I decided to make something small, simple and easy to carry small projects out and about. 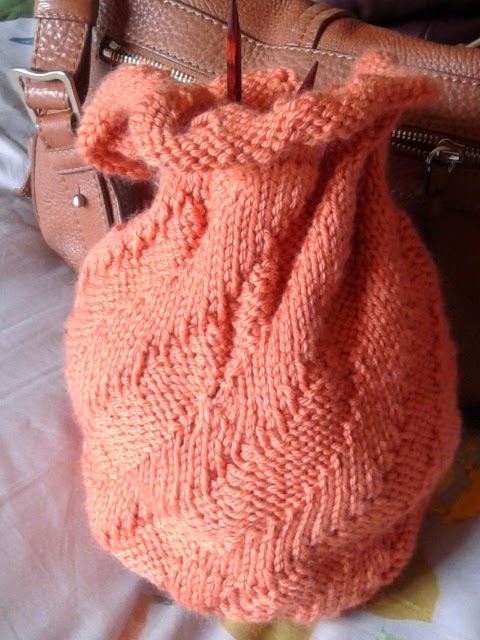 So I made this bag using 2 balls of Debbie Bliss Cashmerino Aran which I found in my stash that I completely forgot I had. 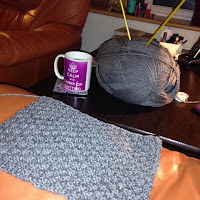 I used this pattern: Small Project Bag which I found on Raverly. 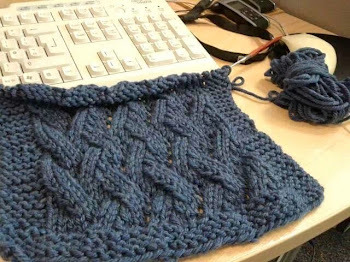 It was quite an easy pattern to do, and another beginner project for those that want to venture in the world of knitting in the round on DPNS. 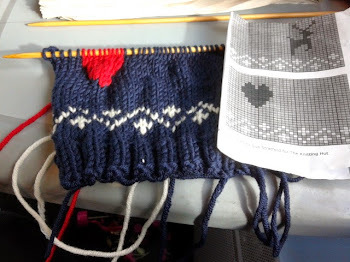 I followed the pattern exactly, however I added an extra repeat to make the bag a little bit bigger. 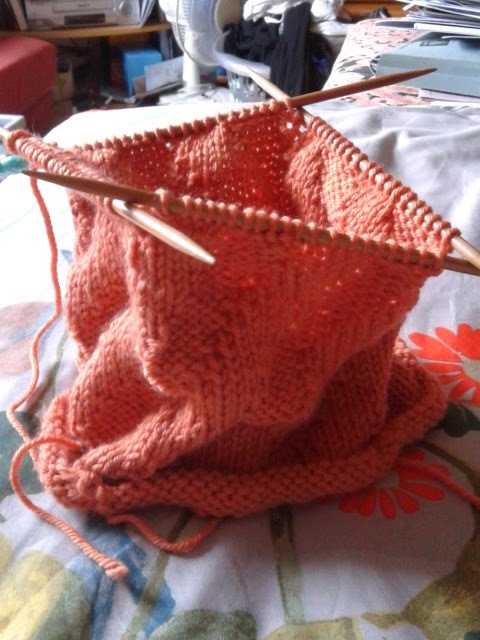 The only thing that I need to do with this right now though is make the twisted cord. Aside from that, I'd also like to add lining and make the base more solid, which I'm pretty scared to do as I don't really sew so I'm wondering how to go about it exactly.....I may ask my sister to show me what to do..but if any of you have any advice or tips on how to go about it, that would be very helpful. 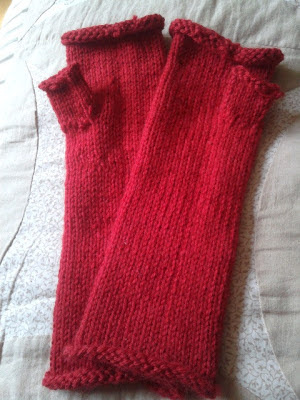 I'm very sad to say that those that guessed, didn't win the Angel Knit Kit. I'm wondering if its because it was too difficult to guess, or whether people didn't like the kit...or whether it was because of my stupidity in adding the project to Raverly so most of you probably knew what it was, anyway lol. Oh well...I thought i'd do something fun with this blog but guess it didn't really work huh? 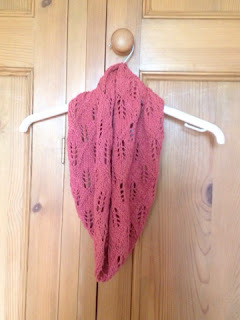 I've also got another FO, but I will do a blog post on that in a few days. I just wanted to keep this post as short as possible. Hello everyone! Hope all is well. I'm back with another blog post of my latest knit, and along with that I thought I'd also review the yarn I used too. Anyway, in April we were blessed with another addition to our family. My sister in law gave birth to a baby boy which in our family right now is really a pretty big deal since the last boy born in our family was almost 30 years ago! That's an awful long time! So anyway in excitement of the new arrival, I decided to make something with love, for the little man. I didn't want it to be anything too hard or that would take ages yet I didn't want to make a pair of baby booties either, what with baby being born in April and its also nearing summer so the weather is a little warmer and while babies are meant to have their feet covered to keep their little feet warm, I think knitted booties might be a bit too warm for a spring/summer baby. Well, that's the way I think anyway. Excuse the colour in some of pictures - the true colour is of the blanket, in progress laid neatly on the table and in the final two pictures. I think its safe to say my phone camera is pretty useless hehe. 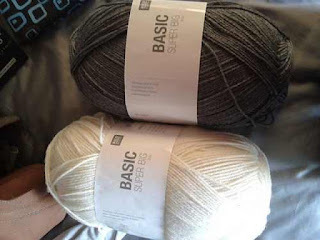 Now as for the yarn itself, I didn't love it. 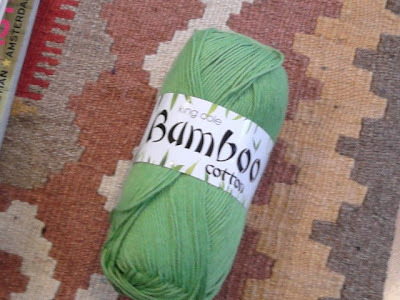 While its a very nice light weight yarn and makes the blanket somewhat nice and light weight as this baby is a spring/summer baby, I didn't actually enjoy using it for the project. For some reason this yarn was somewhat a bit splitty if that makes any sense, when it came to using it whilst knitting. thats the only downside to using the yarn in my opinion. Sorry, I'm useless at writing reviews. Hi all. It's been a while since I posted, I know. Lots of things have been going on in my life, one major event is becoming an aunt to a beautiful baby girl. Sorry, no baby pics. I don't think my sister would be thrilled if I posted a pic on my blog without her permission. But all is well. We had a nerve wrecking few weeks but Baby Beatrix is doing wonderfully. These were such fun projects and I look forward to doing more like them. 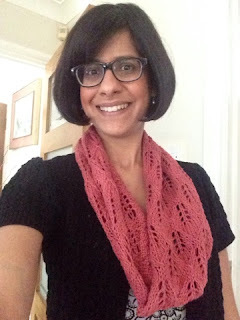 Aside from these I also ventured into lace knitting and made a chunky lace wrap for my friend for her birthday, which was called Resonance by Kelly Menzies, which is also in the October Issue of Let's Knit. Here is the pic of the wrap. Hello everyone, I'm sorry for being a bit absent of late. 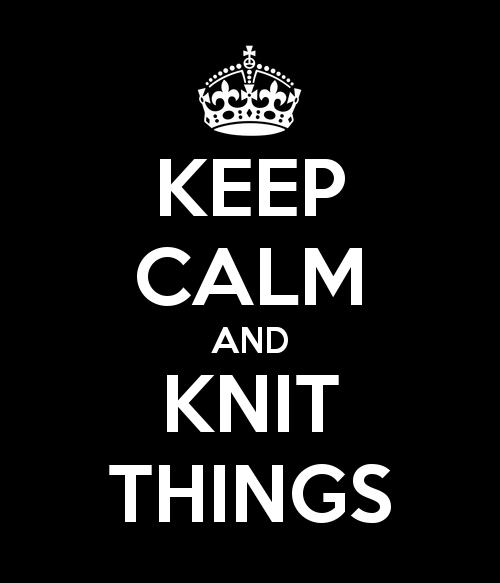 You see, I've been knitting! Really!! Lots!! I have been knitting so many things since my last post - gosh, knitting is quite addictive. But I suppose its a healthy addiction. 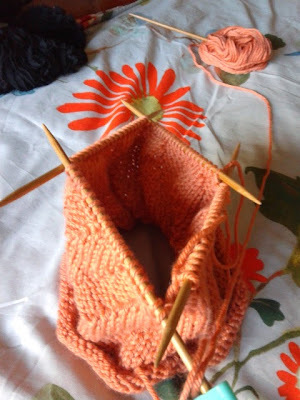 In my last post I mentioned the difficulty of finding circular needles that don't hurt my hand and I was ready to throw in the towel and decide that perhaps using circular needles wasn't for me. But I was wrong. 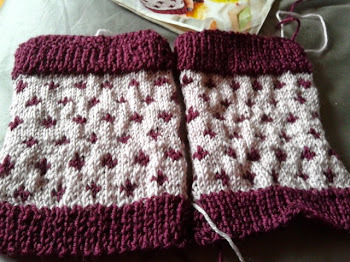 I tried Knit Pro's Symphonie Rose Cubics and they seem to work, so far no hand pain - yay! 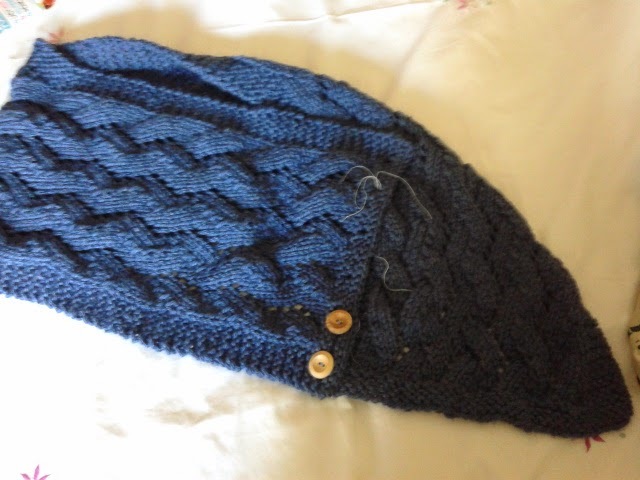 This cowl was a very easy, straightforward knit, and a great pattern for a beginner knitter, and I managed to knit it up in 3 days. 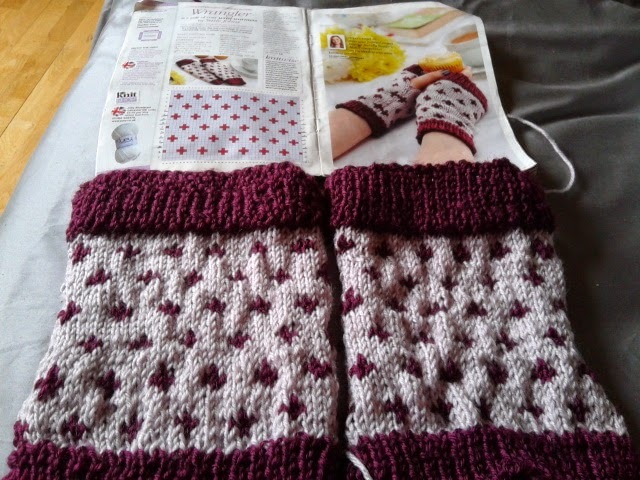 I used Stylecraft Life SuperChunky for this project and I'm very glad I did because its so soft, and my cowl is wonderfully warm and cosy. Finally, I mentioned in my last post about knitting little hats for the Big Knit 2013. If you didn't read it, these hats are knit in aid of Age Concern. You'll have seen little hats on innocent drinks smoothies over the years, well this is why. Innocent drinks donate 25p for each bottle of smoothie sold with a hat on it. 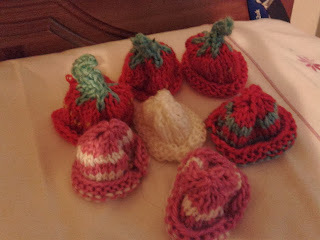 Here are the little hats I did. I made these using what I had in my stash of DK yarn that i got from a magazine which i never used. 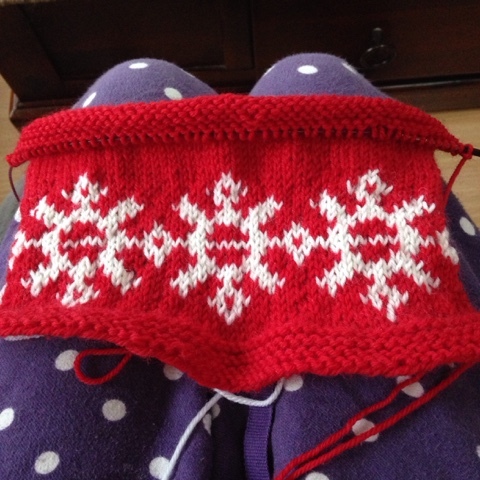 I didn't make very many on account of being on holiday and having several WIPs on the go, but next year I plan on doing more. 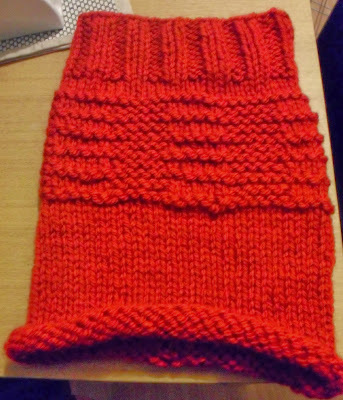 It was quite fun knitting these up and they didn't take long at all. 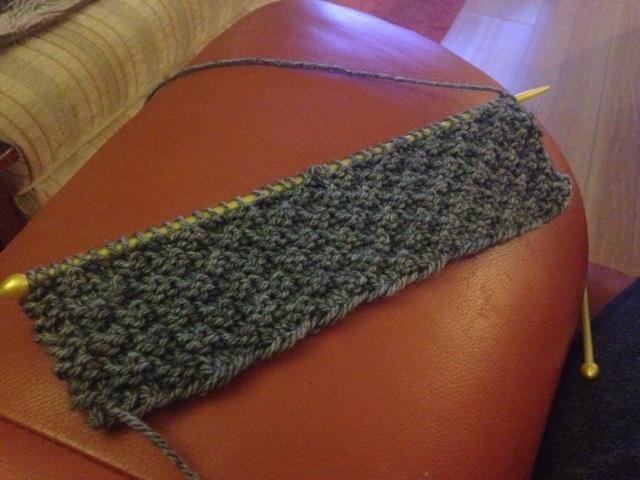 I look forward to knitting more in 2014. Hello everyone I hope all my readers are well. This is just a short post to say hello. I'm sorry I've not kept this blog up to date. To be honest, I've not knitted anything really since my last FO. 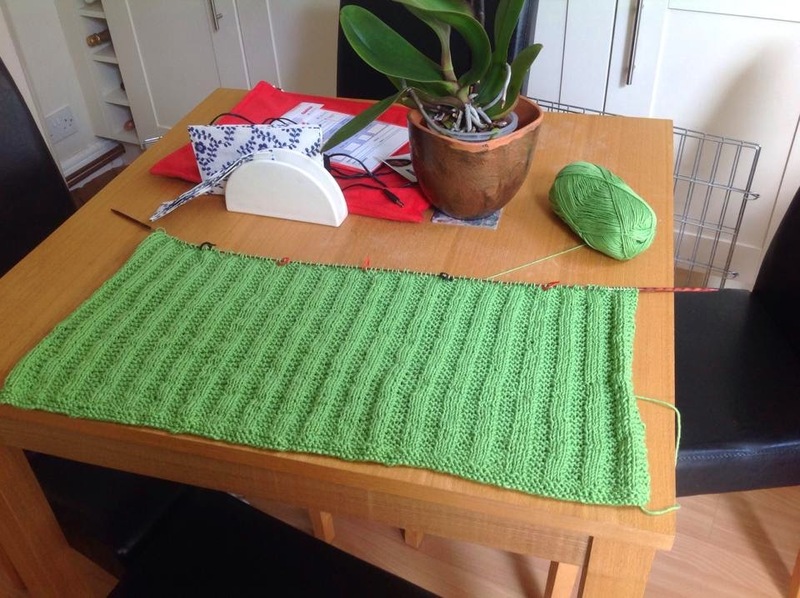 I did attempt to try and make my first garment using circular needles - unfortunately that was unsuccessful - not because I couldn't actually follow the pattern or anything like that, because the pattern looked easy as. 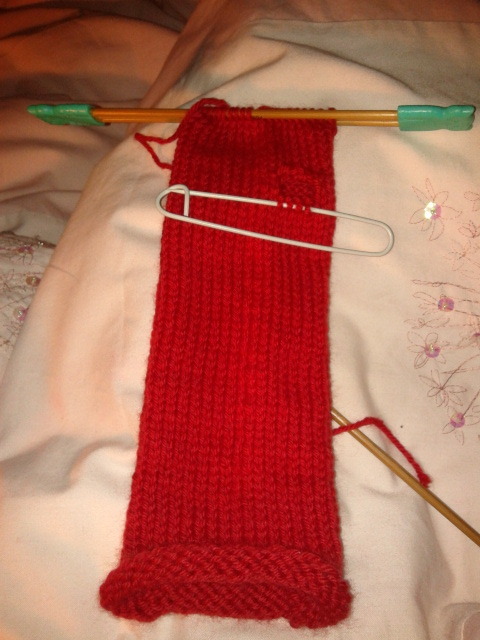 But no its to do with the fact circular needles don't seem to be hand friendly for me, funnily enough. I've tried metal fixed ones, they hurt my hands. So then I tried Knit Pro's Spectra interchangeables....that made no difference. So I am guessing perhaps, using circular knitting needles is not for me? If thats the case that's a shame because there are so many easy seamless patterns on Raverly that I would love to try - unless anyone can recommend anything i can do to make my hands pain free while using them, that would be awesome. 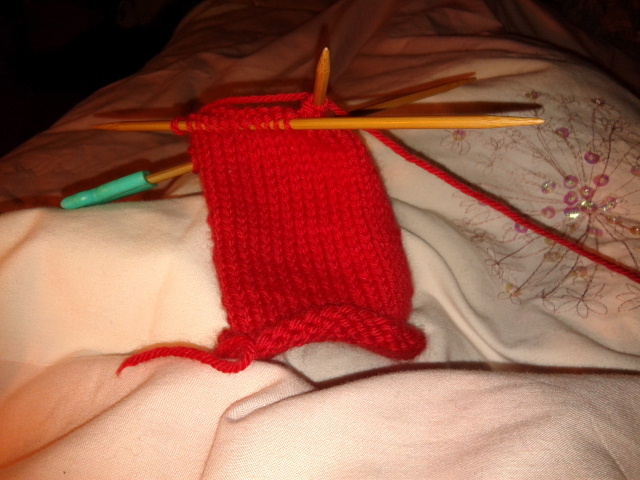 So while my hands were hurting I took a long rest from knitting until my hands felt normal.. 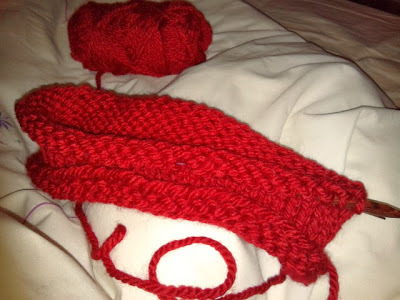 In the meantime I am knitting little hats for Innocent drinks' charity campaign for Age Concern, which I am actually finding fun! These hats are so cute! 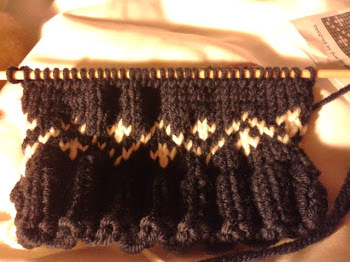 I've knitted two so far - I wonder how many I can make end of September. I'll post pictures in my next blog post. Hello all! Hope all my readers are well! Well I'd like to announce that I've taken the plunge and knitted.....fingerless arm warmers lol! 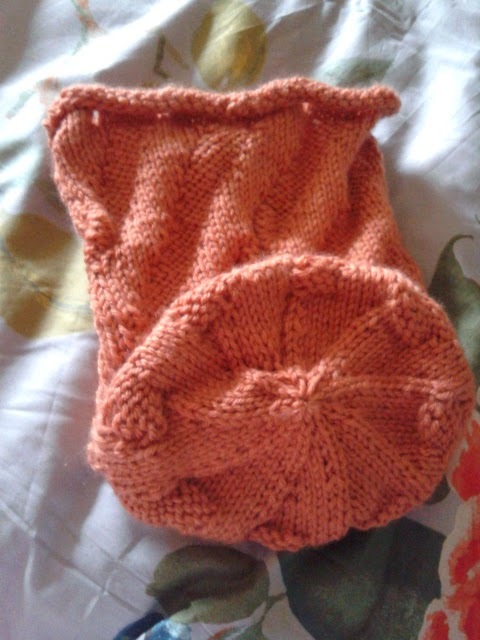 No, seriously, this was my first knitting in the round project. No, I lie, its my third...but its the first I've completed. I first learnt how to knit in the round using DPNS (double pointed needles) two years ago on a sock knitting class held by the lovely Jane at Tea And Crafting but I had such trouble knitting my first pair of socks that I kept frogging and starting over and in the end I got frustrated so I gave up. Two years later I thought I'd try again and thought I'd try tackling knitting in the round with a more easier pattern, inspired by my sister who knitted her own Toastys - pattern here. 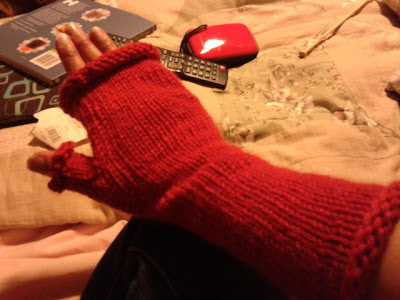 I actually enjoyed knitting these. The thumb was the only part I had been having trouble with, but with a lot of patience, I succeeded. 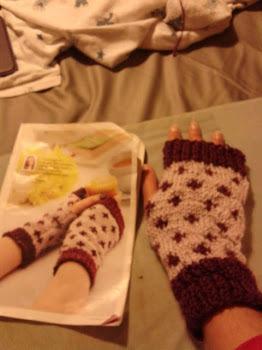 I added an extra stitch for the thumb as I do like a bit of room - and my thumbs are big lol! I used Debbie Bliss Cashmerino Aran for this project. 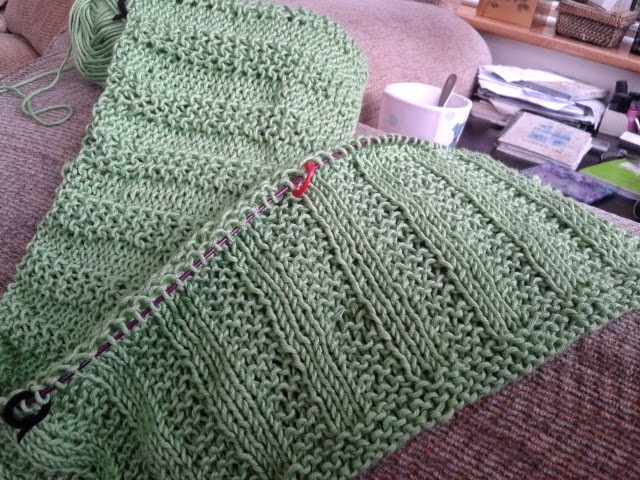 I love the feel of the yarn. 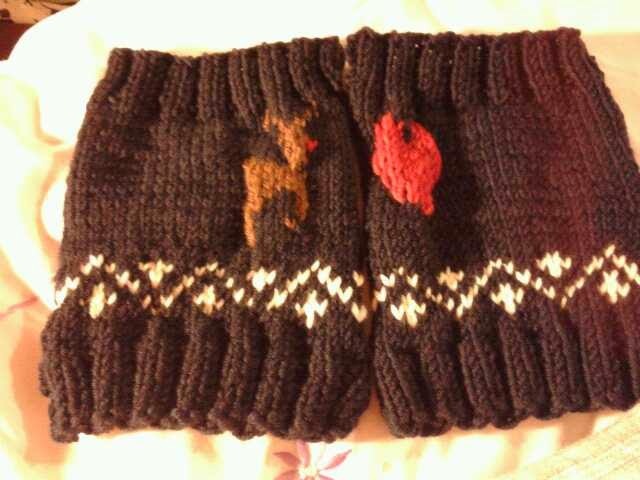 I actually can't wait till winter now so I can wear them hehe - wait, did I really just say that? I hate winter! LOL. 30 something, who enjoys reading, cooking, knitting, dogs, movies and food!